WHISTLER BLACKCOMB is considered by many experts to be the best ski resort in the world. It is certainly the biggest in North America. Whistler and Blackcomb are two side-by-side mountains which offer over 200 marked runs, 8,171 acres of terrain, 16 alpine bowls and three glaciers. 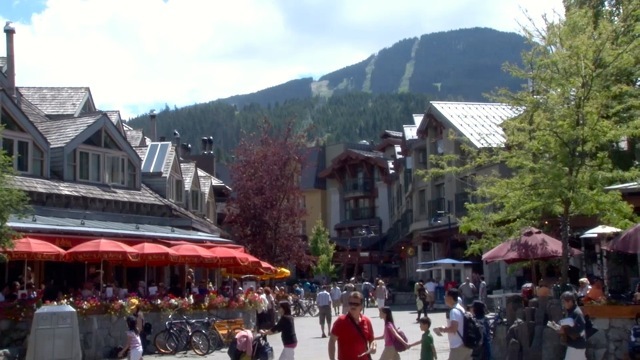 In the summer, Whistler Blackcomb offers a variety of activities, including hiking and biking trails, the Whistler Mountain Bike Park, and sightseeing on the PEAK 2 PEAK Gondola. There is no question to the year-round fun and enjoyment that awaits. All you have to do is get there. Why not make the journey to WHISTLER BLACKCOMB part of the pleasure ... let Town Car Service drive you there in comfort and style. Relax and enjoy the breathtaking scenery along the Sea to Sky Highway. We offer Lincoln Town Car, SUV or stretch limousine service. For larger groups we can provide Sprinter vans and limo-buses. Whether you are 1 or 100, we will get you to the mountains safely and smoothly. We also offer custom Vancouver Sightseeing Tours. See more information and video that includes places on the Sea to Sky Highway.